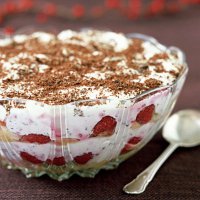 This delicious trifle is a take on a traditional Sicilian dessert, with the flavours of candied citrus, dark chocolate, creamy ricotta and liqueur-soaked sponge. Place half the trifle sponges in the base of a glass trifle bowl or dish. Drizzle over half of the Marsala or Madeira and leave to soak for 5 minutes. Scatter about a third of the raspberries over the sponge layer. Place the ricotta in a large bowl and add the icing sugar and half the cream. Combine with a fork until smooth, then stir through the mixed peel and remaining raspberries. Chop two thirds of the chocolate into small pieces and stir into the ricotta mixture. Spoon a layer of the ricotta mixture on top of the sponge bases and then arrange the remaining sponges on top of the ricotta. Drizzle over the rest of the Marsala or Madeira and then spread the remaining ricotta mixture on top. To serve, whip the remaining double cream in a clean bowl with an electric or balloon whisk until it makes soft peaks. Spread it over the ricotta mixture. Grate the remaining chocolate and sprinkle over the top. Chill before serving. This tastes even better when eaten the day after it is made. If you do not like mixed peel, replace it with a little grated lemon zest to give a citrus flavour.